I want to start off with a huge thank you! Because of users like you, Shopping Cart Creator has been successful beyond our wildest dreams. We couldn't have done it without you! When we first hatched the idea for this software, we never imagined that literally thousands of online stores would be set up within a few months. An incredible number of people have started selling online for the first time in their lives, gaining a nice additional stream of income in the process. Other users have made the switch from complicated legacy solutions and have told us they'll never look back. We're immensely proud that we've created a product that's easy to use and that helps people realize their dreams of small business ownership. There are two components of the Shopping Cart Designer workspace: Theme view and the Properties pane. Use the fields in the Properties pane to make edits to background colors and images, text, links, borders, and logos. Your changes are applied in the Theme view area, so you can preview your adjustments as you make them. You can make edits to a preexisting theme or create your own. When you're happy with how your theme looks, you can export it to Shopping Cart Creator from within the program. Just click the Export button and select a name for your theme, and then open up Shopping Cart Creator. The theme will appear in the list under the Theme tab of the Shop Settings window. Your shop management options, including adding items, changing prices, writing text on your static pages, etc., are still conveniently located in Shopping Cart Creator. This means that Shopping Cart Designer can't be used to edit text. After all, the program wasn't meant to replace Shopping Cart Creator as your content manager-- it's purely a design program. 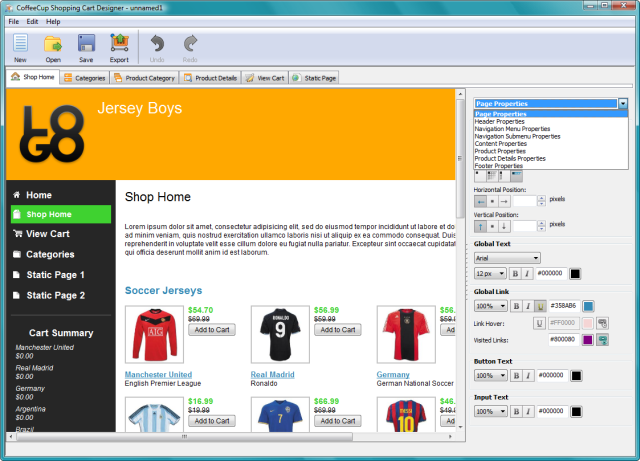 Shopping Cart Designer is our first application delivered in two different versions, one basic and one professional. We recognize that not all users want to configure their shop the same way, so we tried to balance the features and functionality carefully for users of different skill levels. The basic version is a great tool for beginners who want to edit broad aspects of the appearance of their shop. However, more advanced users may wish to customize the nitty-gritty aspects of the design. That's where Shopping Cart Designer Pro comes in. This program works in the same way as the basic version, but offers additional customization options, including margins, padding, three different kinds of navigation bar icons, and options to edit the more minute aspects of the design. One thing that really sets this program apart is that it gives users a feel for what CSS can do without forcing them to learn any code. The WYSIWYG interface allows you to see what happens when you make a change to a CSS property. Anyone who uses Shopping Cart Creator and later decides to take the leap and learn CSS will find that they're already familiar with the lingo. We like to think of this as the future of CSS editing -- and you can expect even more cool implementations of this concept very soon. 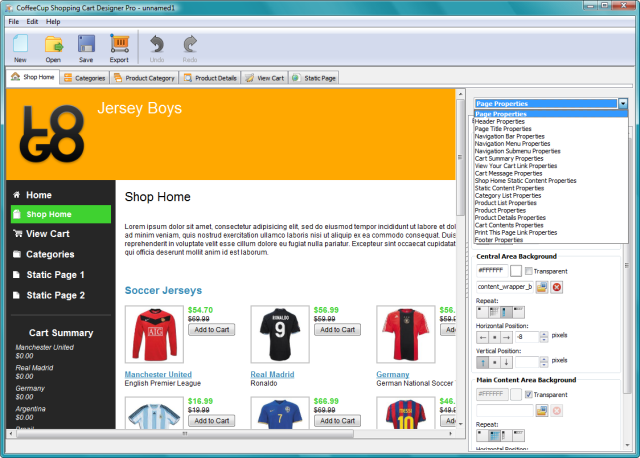 Probably the best part of Shopping Cart Designer is how well it and Shopping Cart Creator work together. 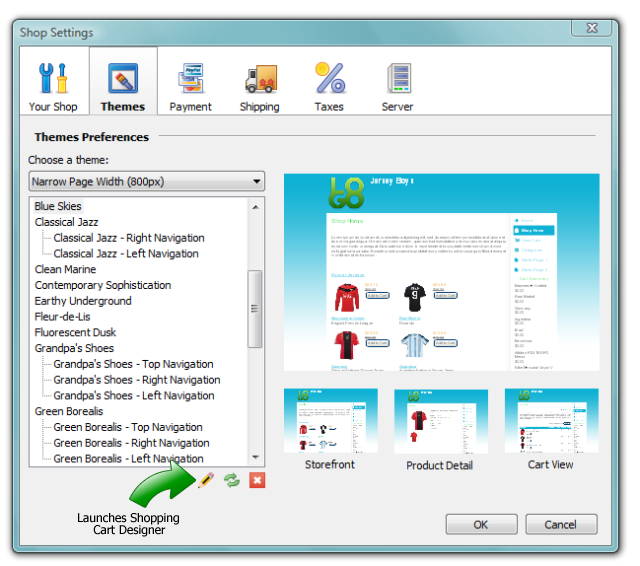 You can open Shopping Cart Designer from inside Shopping Cart Creator, and any changes you make to your themes are immediately available in Shopping Cart Creator. Shopping Cart Designer has all the ease of use you've come to expect from our products, with an easy-to-master learning curve. We are determined to keep building on the success of Shopping Cart Creator and make it the default program of choice for Web shop owners. As you can tell, we're really excited and proud of the newest addition to our family of software, but we're even more excited to hear what you think! If you have any questions, comments, or suggestions, please let us know. So now that you have the 411 on all the great things this new program can do, here's the catch: We're initially releasing this program as a limited edition. Only 500 copies of the basic and professional version will be sold. That's right, only 500! Once it's sold out, you'll have to wait another 6-8 weeks before it's offered again. In the meantime, 500 lucky users will have a chance to show off their fancy new custom themes -- which gives them serious bragging rights -- and be the first to give us their feedback. If you take part in this limited release, you get to shape the future of this program and can tell your grandkids that you were part of the revolution As an added bonus, you'll get a truckload of cool resources with your purchase, including cool navigation icons, useful page backgrounds, header textures, a collection of all-new themes -- in short, all the good stuff you've learned to love from CoffeeCup Software. One last thing before I go: CoffeeCup Software's success is based on word of mouth. Friends telling friends, telling family, telling colleagues. People helping people by pointing to us in Web design forums, CoffeeCup fans posting on Facebook walls, Twitter users tweeting about creating a cool new online store with Shopping Cart Creator. So, want to help out? It's easy: Talk about us! Anywhere! The more people who use our programs, the better we'll be able to make them. That is FREAKING FANTABULOUS Scott!!! Way to go to all the folks at CC for making yet another useful tool for web designers/masters/tinkerers. Thanks. Great, How soon before you post How To Purchase and the prices? The release is scheduled for next week. The price will be determined on launch day. Really great program. I would LOVE for it to be able to provide information to purchasers who want to pay by internet banking only, with an option to opt out of paying by credit card, as most clients I have are small businesses who don't want the extra expense of paying for credit card facilities but want to offer the option of paying by internet banking and providing their bank account for direct credits....please tell me this is something you can work on. It would make it truly the most exciting and functional piece of software for me - yes! This program is for design purposes only. What you are looking for here would be something that Shopping Cart Creator would do, not Shopping Cart Designer. Are you referring to the 'Pro' version or basic version? All beta testers who gave feedback for the basic version should have received a license for the current version of Shopping Cart Creator.